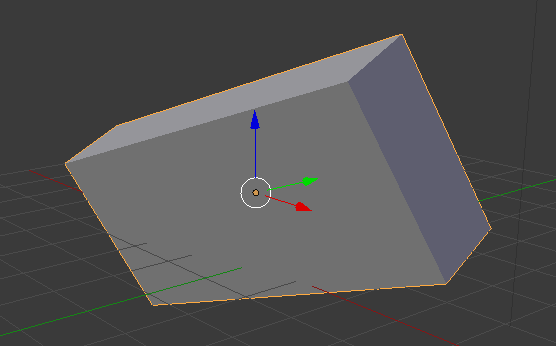 The cube doesn’t mind, and Blender doesn’t mind either, but certain modifiers and other transactions may have a problem with such non-uniform objects. Take the Bevel Modifier for example: it will use the scale values and apply a fixed value to each edge. The result is a different bevel on the top than on the right – probably not what we want. Ideally we’d reset all those values back at zero if this was my final object, taking into consideration its deformation and transformation at its current condition in 3D space. In essence, leave the object untouched and reset the values. To do this, head over to Object – Apply and select what you’d like to reset (location, rotation and/or scale). You can also hit CTRL + A to bring this up as a floating menu. Applying the rotation for example will set all the above values to zero while leaving the object in its current rotational state. The same would happen to the scale and location values, turning the mesh back into a uniform object. Now things like the Bevel Modifier will work with the same amount on each edge, rather than differently depending on how much the object had been scaled.